West Lancs Borough Council stands with LCC over the right to determine local planning applications. 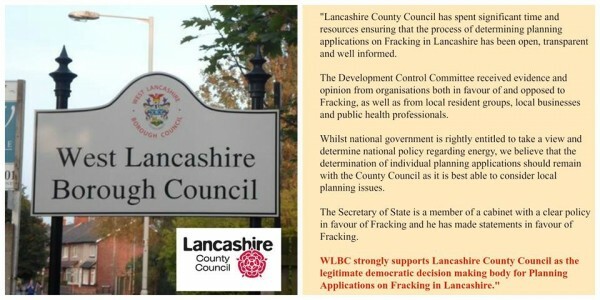 Councillor John Hodson’s motion was passed at West Lancs Borough Council Full Council meeting on Wednesday 24th Feb…..
“Lancashire County Council has spent significant time and resources ensuring that the process of determining planning applications on Fracking in Lancashire has been open, transparent and well informed. WLBC strongly supports Lancashire County Council as the legitimate democratic decision making body for Planning Applications on Fracking in Lancashire”.